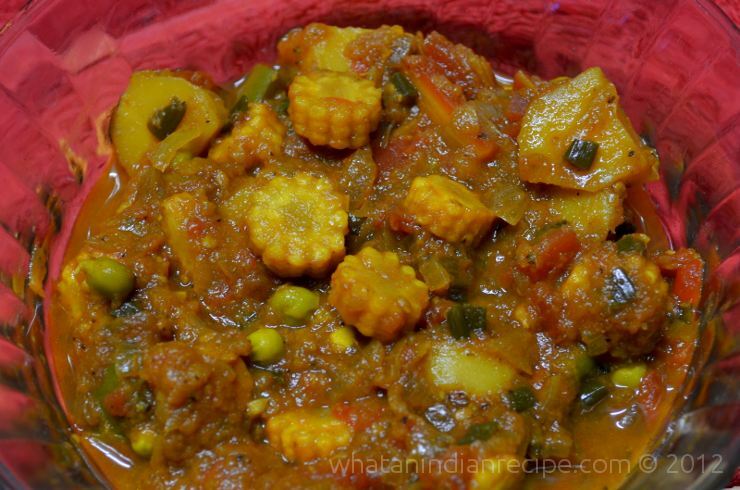 Baby corn is a seasonal favourite, so is this baby corn curry which is easy to make and is best enjoyed with rotis or puris. Make a paste of onion,garlic and ginger. Heat oil in a pan/kadhai add the onion-garlic-ginger paste and sautÃ© for a minute. Now add capsicum, baby corn, potatoes, green peas and spring onions and sautÃ© for another 1 minute. Now add turmeric powder, chilli powder and garam masala and again sautÃ© for two minutes till the masala is cooked. To this add the tomatoes and mix well. Add enough water and salt to cook the vegetables . Once the vegetables are cooked check seasoning and remove from fire. Serve hot with rotis or chapatis.